It is always said that what happens in Vegas, stays in Vegas. I wish Dan Wheldon had not been killed in Las Vegas, but I hope a catastrophe like this one never occurs in racing again anywhere. 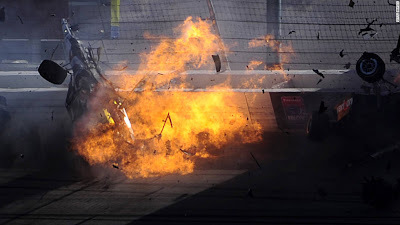 Wheldon died of unsurvivable injuries he suffered when his race car clipped another car and burst into flames after literally flying into a catch-fence. If I were a race car driver, fire would be my greatest fear. When the 15 car pile-up occurred, fire was the mitigating factor. IndyCar was very fortunate that it lost only one driver in such a terrible mishap, but one driver is far and away one too many. The two-time Indy 500 winner is survived by his wife and two young sons. Godspeed Dan Wheldon.